Despite injuries, Sabres finally catch some breaks: Will it be enough? If the Buffalo Sabres make it to the post-season, there’s a few folks they should thank and none wear a Sabres uniform. In a series of events that can only be described as serendipitous, the Sabres still find themselves knocking on the door for the playoffs. They sit in 9th spot, though tied for 8th with Washington with 88 points. Both teams have 2 games remaining, with the Sabres drawing the toughest task – they’re on the road against Philly and Boston while the Caps play the Panthers at home and the Rangers at MSG. Edge: Washington. 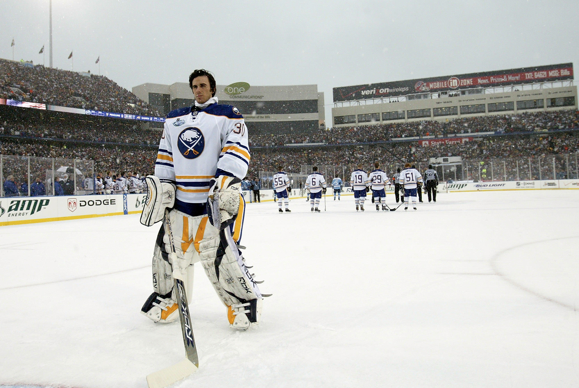 Will Ryan Miller and Sabres be left out in the cold come playoff time? Simply put, there’s no room for error here if you’re Buffalo: It’ll be the Capitals who get to the dance if both teams are tied after 82 games because Washington has one more win. Prior to last Saturday’s 5-3 loss to the Leafs, the Buffaloes had only lost twice in regulation in their last 19 games. That’s as good a run as any NHL team has had all season. It also demonstrates that you’ve got to be lights out fantastic in order to move up the standings once you slip out of contention in the 3-point system – and it still might not be enough. Despite that success, they’re not in it by any means and now injuries to top defencemen Christian Erhoff and Tyler Myers threaten to scuttle their impressive rise. With all that hard work, the Sabres deserve a break or two. They may just have gotten a couple. NHL's leading scorer Steven Stamkos helped Buffalo's cause scoring goals 57 and 58 against the Capitals Monday, denying them crucial points. Break #3 — Sabres fans would never admit it but for a good 10 seconds, the refs swallowed the whistle during a late-game scramble where the puck was nowhere to be seen, bodies splayed everywhere in and around the crease. Most insiders and experts I’ve heard and read agree play should have been stopped but magically the puck came free and voila! the Sabres get a tip-in to send the game to overtime 5-5. 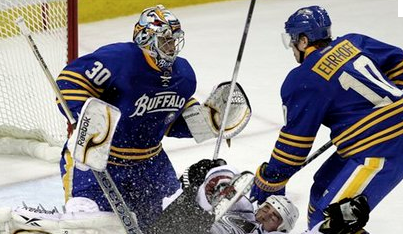 The Sabres ultimately went on to win in OT with a PP goal. Huge relief for the Sabres and their fans, just another meaningless loss for Toronto. 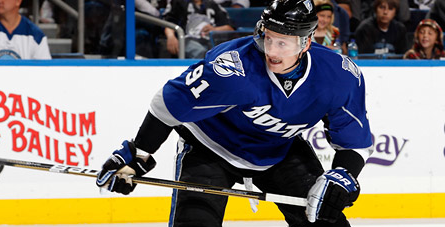 Top Sabres' defenceman Christian Ehrhoff out with knee injury. In the end, maybe that’s better for all concerned: The Sabres keep their playoff hopes alive while Toronto salvages a point in a moral victory yet doesn’t completely blow their chances at a lottery pick. Really, a win-win all round. The Sabres have worked hard to get where they are but at this stage of the season nearly every team sorely needs a break or two. Just hope for Buffalo’s sake they haven’t used all theirs up. This entry was posted in Hockey and tagged breaks, Buffalo Sabres, Christian Ehrhoff, Leafs, playoffs, Ryan Miller, Toronto, Tyler Myers, Washington Capitals. Bookmark the permalink.